The airlifts, which get underway on Monday and are expected to last for four days, mark the start of a new phase of repair work on the path from Glencanisp. 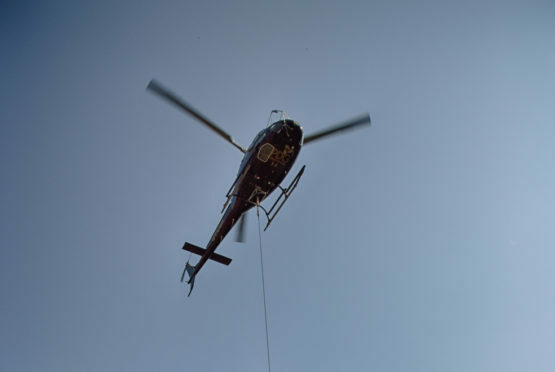 Hundreds of tonnes of stone and gravel will be carried by helicopter to the high slopes of a community-owned mountain in Sutherland this week. The work will carry on through the summer, with the £200,000 project expected to be completed in August. An upsurge in visitors to the mountain is anticipated following the release later this month of the film “Edie”, starring Sheila Hancock as an octogenarian who makes a life-changing decision to climb its steep, remote slopes. The restoration work is being carried out by the John Muir Trust and the Assynt Foundation under the umbrella of the Coigach and Assynt Living Landscape Partnership. The first phase of the project was completed last summer and involves two path contractors and 10 workers. Footpath officer for the John Muir Trust, Chris Goodman, who is overseeing the work, said: “When we began the work last year, the main approach route was boggy and waterlogged and had begun to widen into an unsightly scar on the landscape. After four months of intensive work, we managed to transform it into a robust path that looks natural and blends in with its surroundings. The fundraising appeal to support the work has been backed by mountaineering legend Sir Chris Bonington.